Don't try this at home! OMG what a mess putting out a fire makes! Put the fires out Last. I know, seems kind of backwards. But I think as a stock photographer it is an important point to at least consider. There are so many “fires” or “sparks” that can turn into fires, that if you put them out first you won’t have much time left to do the really important things. As a photographer, for me at least, the really important thing is to make images (OK...equally important as a stock shooter is to get the files into distribution). But as a business owner it feels like all I have time to do is to put out fires. I came in this morning to an e-mail from a company needing a hi res file, another company checking to see if one of my images was available, a call from my accountant (probably wanting to get paid), a request from a teacher about advice for a student on how to become a professional photographer (arrrgh! ), and a message from a charity asking for a print donation. On top of that, I am preparing for a trip to Thailand, have a growing stack of bills on my desk, two unread books and one that has been started, a huge file of images to be uploaded to my online database (including key wording and all that craziness), and an intern who needs help. All those little distractions never go away either. My preferred method of operating is to get rid of all those little things, put out all the fires, clear the decks and get down to the fun part of making images. But that is backwards…leaving very little time to do that all-important task of making my photos. Sometime ago I altered my routine to one in which I spent the morning making images or getting them out the door (portal?) to the agencies that represent them. That resulted in a significant increase in my productivity. But every once in a while I suddenly realize that I have fallen in to my old habits and am busy running around like a chicken with its head cut off trying to get all of the minutiae out of the way…an not “gettying” (intentional misspelling) to my real work. Getting home just in time to write these blogs or upload and key word some more images. At any rate, if you find yourself constantly putting out fires and not creating enough images, you might try coming up with your own version of a schedule that places first things first…you might just be surprised at how well that can work. I guarantee you that all those little fires will still be there when you get to them! 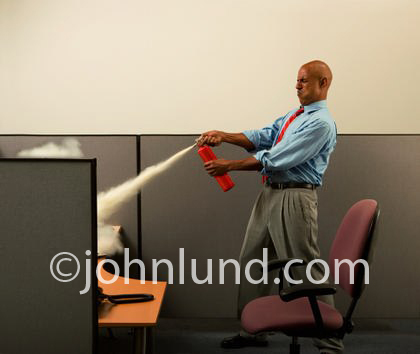 To create the photo of a businessman putting out a fire in his cubicle I first set up the cubicle walls in my studio (I purchased a set of cubicle walls at a used furniture store in order to have the flexibility to create this kind of set at will). The portion of desk that is visible is a desktop I purchased a Ikea for a similar reason. For the extinguisher I just grabbed the fire extinguisher from my studio kitchen…this was a spur-of-the-moment idea. I gave the model a count down to set off the extinguisher, “Three, two, one, go” and started shooting. I got exactly three frames off before I could no longer see the model. Who knew how much crap could come out of one of those little extinguishers? Geez! I don’t think we ever did get every surface of that studio cleaned after that shoot. For those of you who shoot out of your own living rooms and garages…that old adage of “don’t do this at home” couldn’t be more true! Nice shot John, but I'm surprised you didn't composite the smoke. Hey, part of the fun are all of those unexpected turns! Unbelievable. I thought I was the only one... I can relate to this post in more ways than one. I actually got into the habit for a while, of keywording/uploading in the AM prior to taking a lunch break, and I was killing it! Sad to say, I keep on falling into my old routine, hustling to try and get everything done before 6pm. That never seems to happen, either. First thing in the morning when I'm the sharpest mentally, fresh coffee down the trap, I can keyword anywhere from 25-30 images per hour - but come afternoon, it seems to drop to around 10-15. Maybe I have too many distractions, or it's because late afternoon fatigue sets in. Anyway, I think your theory on putting out the fires last is golden. 25 to 30 images an hour is a lot more than I can get done. Even at my freshest key wording is guaranteed to put me to sleep. Hey, gotta go...I smell smoke! What Makes You a Special Photographer?